A couple of days ago, an onion-grower from Niphad tehsil of Nashik district had even sent his earnings to the prime minister to mark his protest. A week after the farmers across the country marched on the streets of the national capital – during Kisan Mukti March – for their demands, Maharashtra farmers are distressed with agricultural produce price crash. Prices of onion, brinjal, pomegranate along with other agricultural produce have crashed, and the farmers are now forced to sell their produce for a meagre price, suffering huge losses. Amidst the agrarian distress in the state, the price of premium quality of onion – which was between Rs 10 and Rs 15 per kg – crashed to Rs 4 in the agricultural produce market committee (APMC), Pune. Farmers have dumped their produce in various parts of the state to mark their protest, as the onion farmers are forced to sell their produce for less than Rs 2 per kg. A couple of days ago, an onion-grower from Niphad tehsil of Nashik district had even sent his earnings to the prime minister to mark his protest. The farmer, Sanjay Sathe, had sold 750 kg of onions for just Rs 1064. 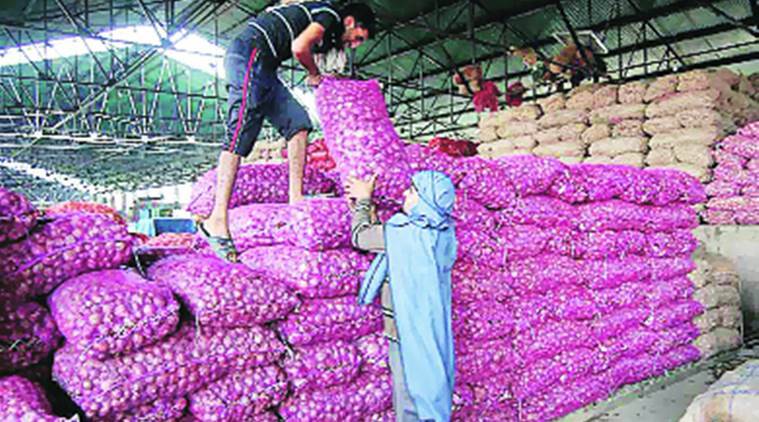 “I produced 750 kg of onion in this season, but was offered a rate of Rs 1 per kg at Niphad wholesale market last week. Finally, I could negotiate a deal for Rs 1.40 per kg, and received Rs 1064 for 750 kg,” Sathe was quoted as saying. According to the Agmarknet data, in Maharashtra, onion has an average wholesale market price of only Rs 757.28 per quintal in the first week of December, and it is 71.23 percent lower than last year. Last year, the price was 2632.45 per quintal during the same time. Rajendra Bawake, a brinjal farmer from the Sakuri village in Rahata tehsil of Ahmednagar district of Maharashtra was offered a rate of 20 paise per kilogram for his produce from the wholesale markets in Nashik (Maharashtra) and Surat (Gujarat). The farmer was reportedly offered Rs 65,000 in total as against the production cost of Rs 2 lakh. The dismayed farmer uprooted all the brinjal plants from his field to save himself from incurring more losses, according to reports. “I had planted brinjal on two acres of land, and laid pipes for drip irrigation. I used fertilisers, pesticides and modern mulching techniques to enhance the production. The total investment came to around Rs 2 lakh. In return, I earned only Rs 65,000,” Bawake was quoted as saying. In case of brinjal, Agmarknet data shows that it had a wholesale market price of Rs 1401.52 per quintal in the last week of November. However, this rate was 3.97 percent lower than the previous year, while the price has crashed to Rs 1354.78 per quintal in the first week of December. The pomegranate farmers have also incurred losses following the crashed prices. In Ahmednagar, a farmer reportedly destroyed his produce, pomegranate, since there was no one to buy his yield even at the rate of Rs 10 per kg. The prices of tomatoes, peas have also seen a downward trend in the first week of December as compared to the prices during the same time, last year. Tomatoes which were sold at the rate of Rs 2171.98 per quintal during the first week of December in 2017, are being sold at an average rate of Rs 596.28 per quintal now. Over the year, tomatoes have seen a crash in price of 72.55 percent. Tonk district of Rajasthan, which quenches the thirst of the desert state, is battling with the water crisis.